← Visiting conferences abroad: cherries on top of an academic cake or an absolute necessity? A matter of social attitudes? From May 23 until 28 2014, I attended the annual meeting of the International Social Survey Programme (ISSP) in Tampere, Finland. The ISSP is one of the major international social sciences projects around the world and measures attitudes on a socially relevant theme. ISSP data are an important source for international comparative social scientific research. The survey has a different theme every year. This year’s theme is Citizenship. A total of 70 participants from 39 countries around the world, ranging from Australia to Canada and from Suriname to Russia, attended the meeting. Since last year Suriname has become an associate member – ISSP-SR is incorporated in my PhD research. One of the conditions of the ISSP is conducting the survey every year, with a response of at least 1000 respondents. For Suriname I am in charge of the data collection and meeting the requirements of the ISSP. ISSP members meet annually. At these meetings decisions are made in a strictly democratic way (ISSP has no governing body or principal investigator). Amongst other topics, a main issue was to decide on the content of the questionnaires for the upcoming 3 years. During the conference I took part in the discussions on the content and wording of questions for the upcoming 2015 module “Work Orientation IV” and the 2016 module “Role of Government V”, as prepared by the Drafting Group. It was interesting to find out how questions could have political consequences in some countries, which questions were not relevant for all countries and how members would interpret questions. For example: in Suriname the question on left and right wings parties would not be relevant because our political system is not structured that way. After 2 days of discussions, where members gave their comments, the questionnaire for 2015 and the list of topics for 2016 were brought to a vote and were accepted after some adjustments. With this, the members can now conduct the survey for 2015. Also, a proposal for a theme for 2017, made by several countries, was presented and accepted by vote. The theme for 2017 will now be “Social Relations and Social networks”. This is a new theme within the ISSP. Traditionally, the Sunday before the start of the meeting, a research session is organized, in which participants are given the opportunity to present papers that are (preferably) related to the themes of the ISSP modules. Together with my supervisor Harry Ganzeboom I prepared a presentation on “Post Stratification and Efficiency Weights in the 2012 ISSP of Suriname”. The paper describes the construction and use of post-stratification and efficiency weights in my survey on Social Mobility in Suriname that included the ISSP Social Inequality IV module. Post stratification weights are used to correct biases, caused by selective non response. In my survey we found for example an overrepresentation of women so it seems relevant to think about using weights or not. Efficiency weights adjust for the fact that the sampling design deviates from the commonly assumed Simple Random Sampling design, but is clustered in multiple stages. In my sample, first there was a systematic sample with a random beginning, where some 60 primary sampling points were drawn; in each sampling point a cluster of 80 respondents were then selected. We found the Surinamese survey to be fairly representative with respect to district, ethnicity, age, education and occupation, but with a strong overrepresentation of women (65%), instead of an expected 50-50% distribution of men and women. This has arisen mostly from substitution within If the targeted respondent was a man and was not found at home, some interviewers immediately substituted him with a woman who appeared to be at home, despite of the instruction that substitution was not permitted in this case. The use of post-stratification weights to repair this, turned out to be of little value, because gender has a minor influence on social attitudes and usually is a control variable in the analysis. Efficiency losses were found to be very strong because of the large cluster size in the sample and are reinforced because in certain areas interviewer portions were very large. These interviewers had an impact on the quality of the survey for example if they would substitute incorrectly or have made mistakes with the coding of occupations, etc. In the next survey we will use smaller clusters and smaller interviewer portions to cope with the efficiency loss. In this presentation we have shown that interviewer effects can also be significantly reduced when respondents used write-in modes and thus answer questions without the intervention of an interviewer. Unfortunately, in Suriname we cannot use write-in modes on a large scale because there is a relatively high level of illiteracy in the interior, compared to the capital. Therefore we have to hire interviewers and conduct face-to-face interviews. The construction and use of weights is currently of strong interest within the ISSP. A special working group is installed at this meeting for mapping this problem within the ISSP data and to come up with recommendations. Ganzeboom and I plan to contribute to this methodological research in future meetings. On the last day, shortly before the closing of the conference, the representative of South-Africa showed a video to promote her country, because South Africa will be the host for the next ISSP conference in 2015. The audience reacted with approval. After some final remarks, the conference came to an end. ISSP appeared to be indeed a matter of social attitudes. Tamira Sno is PhD candidate at the department of Sociology. 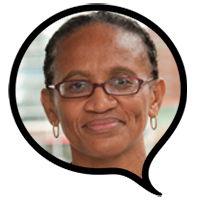 Her research ‘Status Attainment and Social Mobility in Suriname’ focuses on studying patterns of occupational status attainment among Surinamese in Suriname and elsewhere.